There are many causes of gynecomastia. Gynecomastia is very common during puberty and adolescence. Most often it is a temporary problem and will go away as a young man develops. As older men age, it is also not uncommon to experience Gynecomastia due to increased estrogen levels. Other causes of gynecomastia include steroid use among body-builders. The body converts excessive steroids into estrogen and estrogen-like compounds which cause breast development. 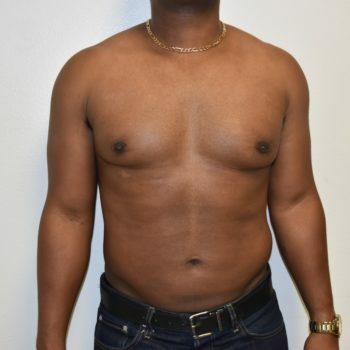 Large weight gains can also cause gynecomastia. Other common causes of gynecomastia include alcohol, certain medications, and marijuana. Often discontinuing the use of these substances will lead to improvement or resolution of the gynecomastia. Rarely, a male may get breast cancer and this can cause unilateral enlargement of the male breast. If a patient’s gynecomastia is severe or embarrassing Dr. Smith can offer options for treatment. The most common is using liposuction to reduce the size of the male breast. Liposuction is usually tried first but may not completely cure the condition. However, it tends to at least lead to a large reduction in breast tissue. Dr. Smith may make a small incision in the male areola and remove the breast tissue. This is done if the breast tissue is very hard and will not respond to liposuction. For male patients who exhibit excessive amounts of breast tissue, a more aggressive approach may be needed. In these cases, Dr. Smith may combine both liposuction and skin excision together. However, combining both procedures together is usually the last option. As a result of the surgery, the scars can be almost as noticeable as the breast tissue was. Dr. Smith will discuss these issues with you. Recovery times vary depending on the procedure. Typically, you can expect a relatively quick recovery period. If liposuction only was performed, the post-operative pain is usually fairly mild. It is possible to return to work after four or five days and full exercise after three or four weeks. If Dr. Smith must remove the skin through excision patients can expect a longer recovery time. Light exercise (except for chest exercises) can usually return in approximately four weeks. Dr. Smith and his team will discuss these details with you at your post-operative visit. Gynecomastia (male breast development), is a fairly common and an embarrassing problem. Fortunately, there are ways to correct this problem. Dr. Smith, a board-certified surgeon, has a great deal of experience in helping men with Gynecomastia and many satisfied patients. If you are considering surgical correction of Gynecomastia make an appointment to see Dr. Smith.